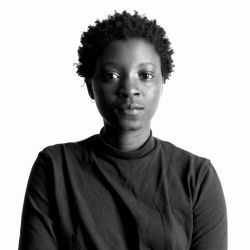 Kudzanai-Violet Hwami was born in Gutu, Zimbabwe. Having lived in South Africa, she later moved to the UK, where she currently lives and works. In 2016 Hwami was awarded a Bachelor of Fine Arts at Wimbledon College of Arts, London. Hwami draws influence from her experiences of living abroad, where issues to do with belonging, alienation, memory, nostalgia, myth-making, and family often surface. The painting, Young Roberta Circa 2080 (2018) taps into the influence of music, film, and internet sub-cultures. Here digital collage is used as a way to interpret the tensions of existing in multiple temporalities. The vibrant colour palette used in this work is a common element in much of her art. This technique, together with her use of interweaving figures and symbolic elements, are often used to revisit childhood memories that reference family photographs. Universal issues pertaining to race, sexuality, gender, spirituality, representation, displacement, and the diaspora are explored with an autobiographical approach. Exhibitions include Les Ateliers de Rennes – the Rennes Biennial of Contemporary Art in Rennes (France: 2018); If You Keep Going South You’ll Meet Yourself at Tyburn Gallery in London (United Kingdom: 2017), and Discoloured Margins at the National Gallery of Zimbabwe in Harare (Zimbabwe: 2017). 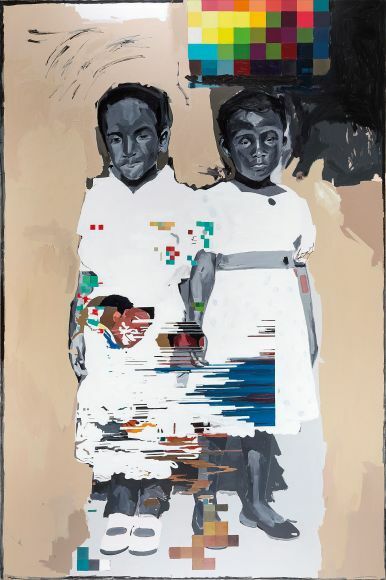 Kudzanai-Violet Hwami work is featured in the Zeitz MOCAA exhibition, Five Bhobh – Painting at the End of an Era (2018 – 2019).